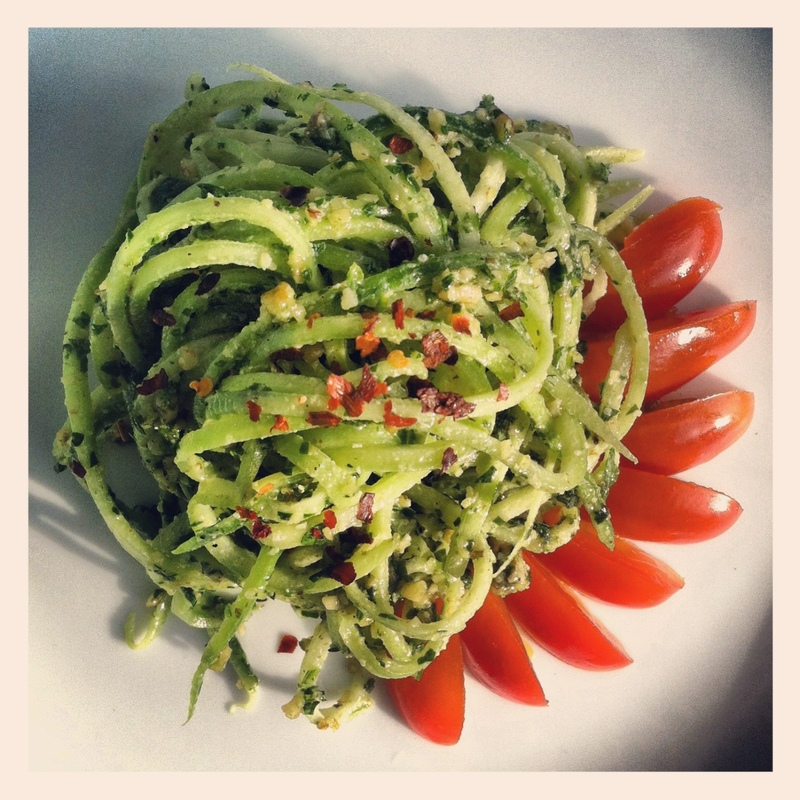 Cucumber Pasta & Pesto. | Eat More Plants. This is, without a doubt, one of my favorite meals. I used my nifty little julienne peeler to make “spaghetti” out of a long, European cucumber. It comes out so beautifully! Besides cucumber, it also works wonders on zucchini to make spaghetti. I made a quick pesto with walnuts and parsley. I ground some pink salt and pepper into my food processor with about a cup of each walnuts and parsley. As I processed, I streamed in olive oil, probably 5 tablespoons in total. I know usually when you think of pesto you think basil, but it’s really easy to make it with any nuts and herbs. A classic pesto is basil, pignoli nuts and Parmesan. I didn’t have the pignolis and obviously wanted to make it vegan by omitting the cheese. Walnuts work well for pesto because of the high oil content. I even like adding kalamata olives or sundried tomatoes to my pesto as well. The olives give it such a nice flavor! Once you go raw, you never go…back?